Hi there! 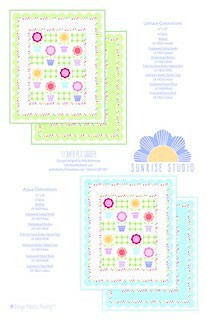 Yesterday I was a bit of a slacker.. no post.. but I'm back here today with the Sunrise Studio pages for you. This first collection's colors coordinate with the Pam Kitty Garden colors. There's a great Grandmother's Flower Garden print, and the colors are scrumptious. 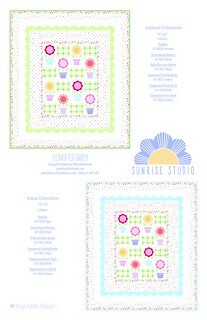 It's paired in the above quilt with the new scallop fabrics! That's right! Scallops. Holly has designed this with a corner unit that you can cut out and use to border a quilt. No mitering needed! There's also some very clever fencing. It has it's own corner piece as well that you can cut out and use to finish of your borders. Paired with the large flower pots and the scallops it makes a darling fast and easy quilt. With this collection, she also showed an idea page, where you can jump start your imagination and think of ways to use the new fabrics! 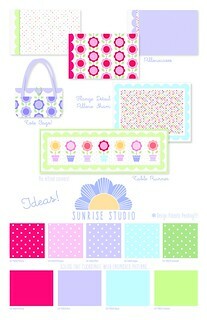 This collections also includes 4 new solids and 5 dots that coordinate. I'm crazy about it all!! Well that's just about all the fun project pages in the booklet. I hope you're just as excited for all these new fabrics as I am. The hardest thing about this collection will be waiting for it to arrive next January! Love every single bit of it! So very clever! I just love the scallops and fencing idea. 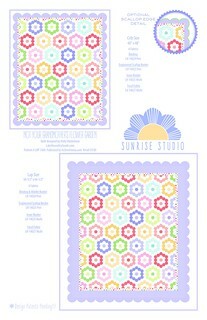 The hexi print will make a great backing, and I'll have to stock up on the dots and solids! I can't wait to wait some of this. I have a lot of your gorgeous fabric just waiting doe that special project. Have a nice day.